I have long been fascinated by the iconic Waterloo helmet, housed in the British Museum. The Iron Age original sports horns, fine repoussé decoration, hatched bronze rondels that were once enamelled, and hundreds of tiny spherical-headed rivets. Sounds like a daunting build – especially as I have orders for two! 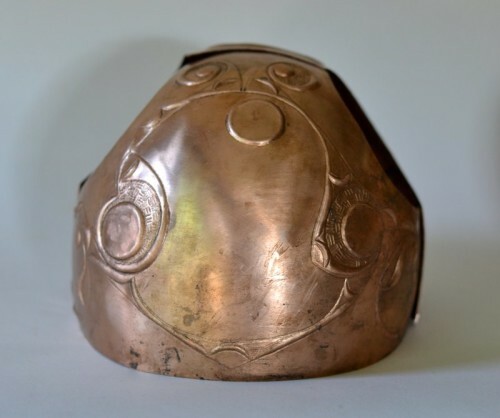 As those who have commissioned or built armour in tin-bronze can attest, laying hands on sheets large enough to make a project without recourse to welding is often impossible. Thanks to the multi-plate construction of the Waterloo helmet, however, the narrow sheets that C510 phosphor bronze come in work just fine. The bronze doesn’t come cheap, though, so after scaling and patterning I made a hasty prototype in steel, to avoid unnecessary waste. Then, as a treat to myself after several tedious days crouched over a pitch bowl, I spent a long day sanding the embossed decoration. After riveting the halves together and binding the bottom edges with bronze, I moved on to the horns. I feel that the form and angle of the horns are an important aspect of this helmet’s character, so I made a silhouette pattern of the helmet to ensure I deviated as little as possible from the original. 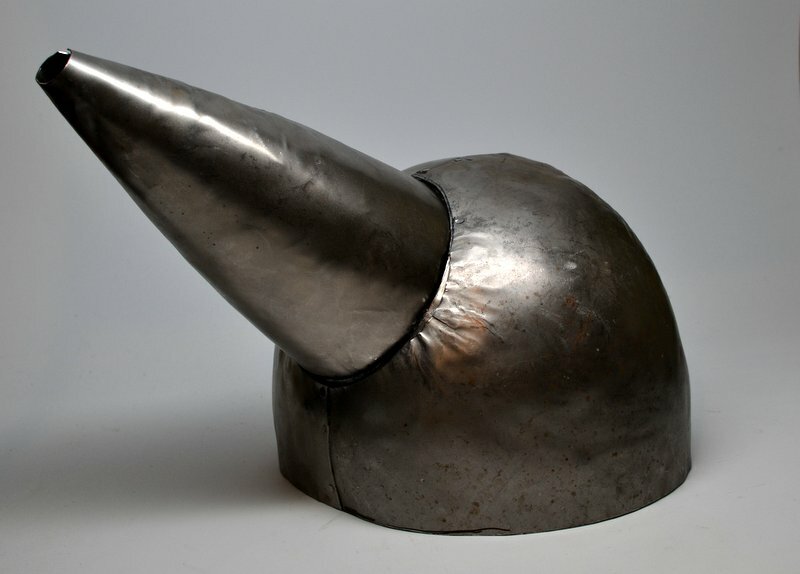 What I noticed is that the horns lay closer to horizontal than might be expected, and that their rounded conical form is not entirely symmetrical – the cones bulge more at the top where the seam is. With those factor in mind, I made and attached the horns. 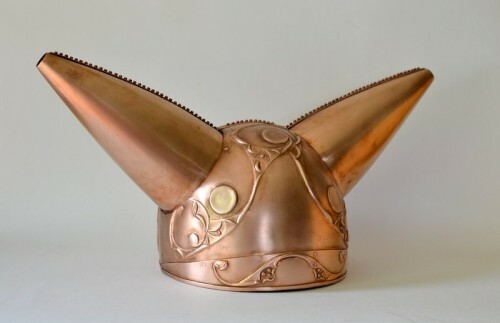 The seams of the horns – actually all of the seams on the helmet except the overlap of the brow reinforcement – are covered with decorative bands studded with literally hundreds of tiny rivets. Only a fraction of them pierce into the helmet to fulfil any structural role; the rest are just there to impress. Perhaps it is easier to appreciate the statement that tight rows of frivolous rivets make when you have made 500 of them by hand. Up next are the hatched rondels, rings for a chin strap, horn terminals… and plenty more rivets! Continue to part two of my Waterloo helmet build to see the conclusion of the project.